The whole concept of planning seems to depend on some form of determinism. This determinism is implicit in the behavioral approach to psychology and is illustrated in experiments on animals. The famous work of Pavlov in Russia has obviously influenced the entire communist concept of planning, the conviction being that the same principles which are applied to the lives of animals can be applied to the lives of men. It is sometimes asserted that the time will come when the conditioning of people will be so fully developed that they will do automatically what they are supposed to do. People will then act as harmoniously as the plan determines that they act. In the utopia of central planning, thus so confidently sketched, nothing will be left to chance decision, and men will be treated with the same stimulus-and-response pattern that now obtains with plants and animals. All of this sounds lovely, but it has at the heart of it a deep logical problem. There is no point in making plans unless causal determinism is true; yet, if causal determinism is true, the very basis of central planning is destroyed, because the government planner is himself determined. By a strange lapse of logic, the believer in causal determinism always excludes himself from the system which he is putting into effect. Since most believers in planning operate at the supposedly practical level, they tend to ignore these intellectual difficulties. But, provided planners for others try to be consistent, they are bound to be in trouble. If we accept the philosophy of determinism, then the planner himself is not free, and does not really plan, but only illustrates the causal determinism of which his action is a part. All that the planner can possibly do is to say that he is doing exactly what conditions force him to do, with no decision of his own, but, of course, no planner will actually settle for this in practice. He believes, for some unstated reason, that he is an exception to the rule he needs. Lenin's way out of the difficulty is by his conviction that a few men, the vanguard, are, in fact, exceptions. But, if there are exceptions at all, the law of determinism is not a law, because it lacks universality. The chief reason why we do not normally see this glaring inconsistency is that we emphasize nonhuman situations. The psychologist and the animals are so far apart in their levels of being that the system seems to work. The botanist may reasonably be supposed to plan the growth of the tree, since his personal decision is outside the system of botanical life, but once the determinist system is applied to human thoughts and actions, including moral actions, the situation is radically altered. The social worker, unless he is unusually sophisticated in the philosophical sense, tends to favor a determinist philosophy. This is so because he can plan a project, like that of slum clearance, and his belief in determinism gives him assurance that his experience will work effectively in altering the course of other human lives. If human actions follow inevitably from prior physical and social conditions, as he tends to suppose, then all that he needs to do is to arrange the conditions and await results. But this simple philosophy is shattered once the planner begins to see that, according to his own philosophy, the very effort to plan was, itself, determined by prior conditions. The upshot is that, if his philosophy is true, the planner does not plan at all, but he is merely the passive performer of deeds which are materially necessitated. Either there is the reality of choice, in which case planning can never be complete, and the planner must face the fact that he cannot manipulate men's lives in the same way that he manipulates animal behavior, or there is no reality of choice, in which case the planner is himself a pawn. In either case strict planning is impossible. This is a serious dilemma from which, strictly speaking, there is no logical escape. A system which leads to such a dilemma is necessarily suspect, for the chief method of philosophy is that of testing any proposition by noting where it leads. This is the method demonstrated in all of the Socratic dialogues of Plato. The logical problem is the problem of consistency. Because this is a free country, a man who wants to believe in determinism is free to do so, but what he is not free to do is to eliminate himself from the doctrine he proposes. We can honor a believer in the manipulation of other men's lives, provided that he has the intellectual honesty to admit that what he calls his plan is itself not of his choosing. The philosophical issue is not determinism, therefore, but logical consistency. The dangers of planning, which planners often ignore, because they seem academic or overcomplicated, are ethical as well as logical. The chief ethical problem involved in planning is that which Berdyaev has termed the dehumanization of man. The sober truth is that, in central planning, men are pawns. As planning becomes more central and more nearly complete, there is a strong tendency to forget that the ultimate units of any society are persons and that the order exists for their sakes. Unless this is kept in the consciousness of planners, the entire situation becomes impersonal; individual decisions on the part of the people really count for nothing. A development in this direction seems to be intrinsic to an ever-growing bureaucracy. It is almost impossible, for example, to have any large-scale planning without some illustration of Parkinson's law. Bureaucratic control always has a tendency to increase, with the consequent loss of initiative on the part of the people. The danger comes subtly and appears even in the most beneficent of enterprises. Nearly all people believe in urban renewal, which has been going on in one form or another for at least two thousand years, but the tendency now is for this to take on all of the dangers of bigness, so that within a year or two an urban-renewal office may have a flock of employees, many of whom are engaged in servicing one another, and whose attitude toward the public is highly impersonal. It is an easy step for such an office to become the commander instead of the servant of the people. "There is no point in making plans unless causal determinism is true; yet, if causal determinism is true, the very basis of central planning is destroyed, because the government planner is himself determined. By a strange lapse of logic, the believer in causal determinism always excludes himself from the system which he is putting into effect." The moral paradox of planning follows naturally from the fact that in human life there are many valid principles, rather than one. If it were possible, in handling a moral problem, to find out what the principle is and to follow it, the answer would be essentially simple. But this is seldom the case. The hard truth is that we have to be loyal to many ideals at once, and that some of these are inevitably in conflict with one another. In the example of urban renewal, it is a good principle to get rid of slums, but it is also a good principle to let people live where they want to live; yet in many situations one of these principles, when applied, eliminates the operation of the other. The ultimate gains of urban renewal may be very great, but the temporary hardship may be terrible. Thus, in Providence, Rhode Island, some of the colored families have been forcibly moved as many as four times. It is not surprising if they think of themselves as pawns in the bureaucratic game. It is suggested, sometimes, that the moral problem of planning can be handled, or at least minimized, by limiting central planning to public affairs, while the individual is allowed to do what he will with his own private life. One might suppose, on this basis, that each man has the right to sell his labor in any market in which he can be hired, but already this breaks down in many states, because men are not allowed to take certain employments if they have personal objections to joining the unions. One might suppose that manufacturers would have the right, in their own private businesses, to set prices as they like and take the consequent risk, but the government brings to bear all of its vast resources to compel submission to the will of the administration. There is great value in a plan to keep prices from becoming higher, but the price of compulsion may be an inordinate increase in central power which eventually cannot be challenged successfully by anybody. It would be gratifying if we could make a clean distinction between public and private life, and we sometimes sound in our conversations as though this were possible, but the distinction is, increasingly, a blurred one. For example, is the putting up of an advertising billboard a public or a private matter? It is, of course, both. Should billboards be allowed in a good society? There are no neat methods of solving problems of this character such as the methods which can be used with slide rules. "Nearly all people believe in urban renewal, but the tendency now is that within a year or two an urban-renewal office may have a flock of employees, many of whom are engaged in servicing one another, and whose attitude toward the public is highly impersonal. It is an easy step for such an office to become the commander instead of the servant of the people." The blurring of the line between "public" and "private" has been brilliantly discussed by Harlan Cleveland in the introduction to The Ethics of Bigness: Scientific, Academic, Religious, Political, and Military. Here the former assistant secretary of state is able to show, on the one hand, that private business today always has a public aspect and that government always has a private aspect. Mr. Cleveland quotes Frank Stanton, president of the Columbia Broadcasting System, as saying: "We are responsible for what appears on CBS. We accept that responsibility … we are only obligated to do one thing, and that is to be responsible to the American people." On the other hand, our government farms out many of its tasks, especially in the defense department, and allows these to be conducted by private enterprise, yet without private risk-taking. One of the strangest developments of our planning of life is that the government today tends to be the initiative-taker and to provide an increasing number of industrial firms with the chief security they have. It is obvious that there are dangers in this, as well as gains. The essential consequence is that man, being condemned to be free, carries the weight of the whole world on his shoulders; he is responsible for the world and for himself as a way of being. We are taking the word responsibility in its ordinary sense as consciousness (of) being the incontestable author of an event or of an object. Unless there is a deep and genuine sense in which men are free, all talk of responsibility is nonsense, but even the complete system of planning involves responsibility, for the planner professes to be responsible for his own decisions. This he cannot be if it is not possible to act otherwise than the way in which he does act. The best that we can do, then, in our philosophical contribution to the problem, is to insist, first, on consistency, and second, to face resolutely what it means to be a person. If mankind is made up of a multitude of persons, each valuable in his own right, manipulation is never justified. The world of persons is always a world which lacks the fundamental simplicity that would be required for total planning. "The world of persons is always a world which lacks the fundamental simplicity that would be required for total planning." Too often, when we speak of planning, we really think more in terms of the hive than in terms of the human community. It has been commonplace for social philosophy to look on animal society, and especially the society of ants and bees, as models for human society. If we want a society that is entirely orderly, the hive will undoubtedly be our ideal. In it, there is no revolt, no editorial criticism, no waste or competition, no individual initiative. The hive presents a completely cooperative economy in which there is no evidence of resistance and no individuation. It is important to realize that our tendency to idealize the hive is a good example of what Professor Lovejoy has called "metaphysical pathos" or sheer sentimentality. The hive is harmonious, but at a tremendous price. Plato was right in the Republic in pointing out that one cannot have a good social order without a division of labor, but in the life of the hive the division of labor which makes things go smoothly is created to an absolute degree. Each member of the ideal community is reduced to a single function, and thus denied any conception of wholeness. The queen cannot feed herself and does no work, since she is limited to the procreative function. She does not even care for her own children. The greater part of this ideal community is made up of unprocreative females who build, nurse, get food, and fight enemies. The drones exist only as suitors to the queen. The result of such a division of labor is, of course, a clear smoothness of operation, but we must face the fact that it is not really a society at all, since it is merely an association of helpless pawns. The hive is really something like an organism in which the individual bees correspond to cells in a body rather than to true individuals. We understand the hive far better than was formerly possible, because a number of scientists are making careful studies of the life of bees. The upshot is that the hive becomes less and less a valid ideal. We see one of the major dangers of central planning when we realize that it tries to do by intelligent effort what the bees do instinctively. The concept of the hive is almost as far removed from the ethical ideal for man as can be imagined. Insofar as a person is truly a philosopher, he does not give up a position merely because it has difficulties, but will look resolutely at the alternative difficulties before he makes his decision. Almost never do we find a perfect situation in which the ideals are singular and clear, but we must settle on some kind of solution which gives us as few of the evils as may be had. Our cherished hope is that it may be possible to move beyond both the evils of the thesis and the evils of the antithesis into a third way which is better than the usually recognized alternatives. This is our ideal hope in regard to planning. However vivid the dangers of planning may be, we must not accept the alternative of haphazard living. On the other hand, we must not accept total planning, because it would destroy what is most precious in human life, especially its individuation. The third way, the synthesis which we seek, is bound to be one in which we hold the principle of order and the principle of liberty in mutual tension, never abandoning either one. The tension may seem unfortunate, but it is good to remind ourselves that music cannot be played except on tight strings. The good life will always be a life which is essentially risky, for we shall never have security. We shall never have complete order, and we shall never have complete freedom. This is so because we are men. Most of the dangers that we have mentioned are the dangers that are inherent in being persons. The level of the personal is a unique level, utterly different from the merely animal or the mechanical. It is a level in which there is the possibility of greatness and also the possibility of baseness. It is a level in which a man is tempted to manipulate his fellows and yet can realize, when he thinks seriously, that he ought not to do so. It is a level in which beings can plan, but never one in which they can plan completely. The ideal we seek is bound to be a compromise, because life itself has contrasting features that must be considered and included in any solution. Human life cannot be absolutely free, but our test of the value of a system is whether it helps men to be free. Only that planning is defensible which meets this standard. 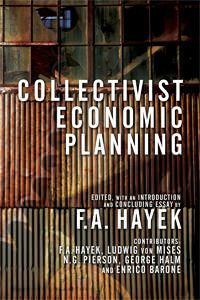 This article is excerpted from chapter 1 in Central Planning and Neomercantilism. For a fuller development of this theme, see my book Philosophy of Religion (New York: Harper and Bros, 1957), pp. 281, 282. Nicholas Berdyaev, who was forced to leave Russia as a Christian rebel against dialectical materialism, wrote many books. The book in which he deals with the process of dehumanization most directly is The Fate of Man in the Modern World. Jean-Paul Sartre, Being and Nothingness: An Essay on Phenomenological Ontology, trans. Hazel E. Barnes (New York: Philosophical Library, 1956), p. 553. For a brilliant treatment of the contrast between the hive and human life, see Susanne Langer, Philosophical Sketches (Baltimore: The Johns Hopkins Press, 1962).